Amma Elaine Glover serves as priest in OCAC and leads the Cross Denominational Mission, the ecumenical outreach of OCAC. Her earlier ministry was in a community outreach called Watering Hole Ministry, associated with Redeeming Our Communities.After this, she went on mission to Baghdad with Canon Andrew White at St Georges Church Baghdad. 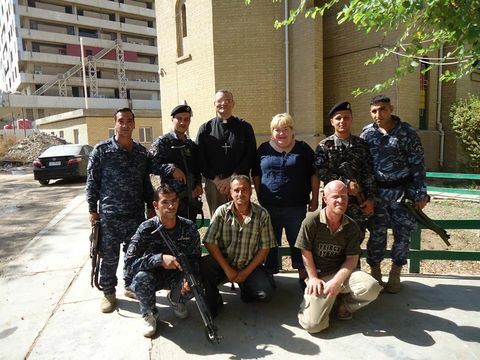 While there she acted as chaplain to the Minister of Justice for Iraq. Later she worked as missionary in Kenya, and founded a church at Chungni in Migori a remote part of Kenya under the religious name Nya Suna which means daugher of Suna. Amma Elaine was a director of REDIM Ltd a not-for-profit corporation for providing education as missionary activity and she was a director of Makongeni Church in Kenya. She was a pioneer in the provision of Girl Child Education in Kenya until returning to the UK. Elaine serves today as a Christian Broadcaster presenting a morning show twice a week on Hope FM Christian radio. Amma Elaine also preaches on the street and has a visiting ministry with local houses of prayer. Amma Elaine has authored 'God's Lent Child' and 'From Baghdad to Suna Migori'. One outreach she supports is The Ark in Reading which has a bus for the homeless and those on the streets.